The definition of antithesis is "a contrary or opposite opinion, concept, or characteristic." So, the sun may be the antithesis to the moon, the devil may be the antithesis to God, and a conservative may be the antithesis to a liberal. In a less obvious sense, however, the concept of antithesis is widely used in literature and film. In fact, it's a rhetorical device used to paint a picture without obviously stating that one character is against the other. It develops a certain tension within the plot that draws the reader or moviegoer in. You can find antithesis examples in your favorite books and movies. You'll also find antithesis used as a literary device, intended to persuade the audience to feel a certain way. Ready to enter onto a pathway of opposites? Some of the most treasured authors of all time relied heavily upon antithesis. In fact, it's one of the best ways to develop a conflict, paving the way to a resolution. It also allows the "good guy" to develop some strength in character and fight back against evil forces. In Julius Caesar by William Shakespeare, Marcus Brutus and Mark Antony were painted in opposite colors. Interestingly, the contrast isn't stark. Shakespeare takes a more subtle approach to antithesis here, portraying Brutus as an honorable - yet slightly naive - man. Antony, too, was an honorable man, but he possessed a certain ruthlessness and ambition that Brutus was lacking. 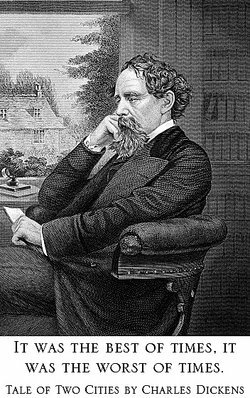 In A Tale of Two Cities by Charles Dickens, we read the line: "It was the best of times, it was the worst of times." Here, Dickens epitomized the very idea of antithesis. How can anything be both good and bad? In truth, life is always a simultaneous balance of the two. In Harry Potter and the Order of the Phoenix by J.K. Rowling, Dumbledore and Voldemort engage in a fiery and electric battle of the ages. They are both powerful wizards, with Dumbledore coming down on the side of good and Voldemort coming down on the side of evil. In Paradise Lost by John Milton, he writes that it is "better to reign in Hell, than serve in Heav'n." Surely, that assertion is debatable, but Milton is making a valid point that it may be better to be in power, even if it's in the darkest depths of the netherworld, than to serve at the feet of another. In The Chronicles Of Narnia by C.S. Lewis, Aslan and the White Witch are constantly at odds with one another. Aslan represents the side of good, whereas the White Witch comes down on the side of evil, sometimes even being compared to Satan in literature reviews. In An Essay on Criticism by Alexander Pope, he write, "To err is human; to forgive divine." This line is painting a striking image and driving a point home. Mistakes are a part of what it means to be human. However, if you want to elevate yourself to a status higher than humankind, you'll have to learn to forgive one another. In Walt Disney's Snow White and the Seven Dwarfs, Snow White and the Wicked Witch are at odds throughout the entire film. Snow White wanted to be kind and helpful to her fellow man, while the Wicked Witch wanted to poison her with an apple, thus taking away her beauty and charm. The whole of Disney's Beauty and the Beast is based upon antithesis. From a very "big picture" standpoint, Belle is the quintessence of beauty and the Beast is the epitome of ugliness. However, even though they're initially presented as polar opposite, they still find a way to each other. And what is the Beast's reward in the end? His beastliness is turned into beauty. We must conclude with the master of rhetoric, the venerable William Shakespeare. In Hamlet, he writes, "Give every man thy ear, but few thy voice." What's the opposite of talking? Listening. True to form, Shakespeare found a far more illustrative way to drive that simple point home. Speakers throughout the ages have employed certain figures of speech as a means of persuasion. Sometimes, they use similes. Sometimes, they use metaphors or allusion. Indeed, even antithesis can fall into their speeches as a way to sway a crowd. And, of course, what would the world of advertisement be without a bent for persuasion? An antithesis can be used to portray the importance of a certain product or idea. Take a look at a few noteworthy examples for historic moments and marketing campaigns. "Unlike short-sighted, egocentric humans, God "sees with equal eye" the fall of a hero and a sparrow, the destruction of an atom or a solar system." - Alexander Pope. Well, I feel the rain. I wanna grow up once again. Antithesis can be used in many different contexts. The common thread is that it contains two contrasting ideas. Those two contrasting ideas are stacked against one another to create a sort of tension, paint a picture, or drive home an important idea. The next time you're writing a story or working on a persuasive piece, see if you can incorporate an example of antithesis into your work. By drawing out the bad and highlighting the good, you can create a piece worthy of acclaim. "Examples of Antithesis." YourDictionary, n.d. Web. 23 April 2019. <https://examples.yourdictionary.com/examples-of-antithesis.html>. The definition of antithesis is “a contrary or opposite opinion, concept, or characteristic.” So, the sun may be the antithesis to the moon, the devil may be the antithesis to God, and a conservative may be the antithesis to a liberal.In a less obvious sense, however, the concept of antithesis is widely used in literature and film. In fact, it’s a rhetorical device used to paint a picture without obviously stating that one character is against the other. It develops a certain tension within the plot that draws the reader or moviegoer in.You can find antithesis examples in your favorite books and movies. You’ll also find antithesis used as a literary device, intended to persuade the audience to feel a certain way. Ready to enter onto a pathway of opposites?